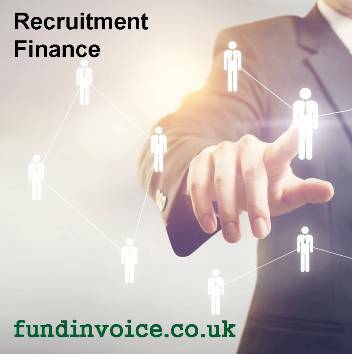 Recruitment companies, both temporary staff placements and permanent placements, are frequently users of recruitment invoice finance. This dramatically improves their working capital position by getting their sales invoices for commissions paid immediately by the finance company. The can help both established and new startup recruiters. In fact, our research (see below) found that 17% of staff agencies use this type of finance (more than 20 times the national average - by our estimation). They also constitute the second largest industry sector currently using these products to fund their business growth. This page pulls together all the relevant resources for recruiters. The nature of the trade in this sector is such that there are normally wages to be paid and low levels of assets to secure traditional types of bank lending, such as overdraft and loans. The rate of growth can also be very fast which can make traditional products less suitable. Sales finance does not require assets, other than sales invoices, as security - and the amount of funding grows in line with turnover growth. The recruitment finance can be provided without concentration limits, even if you only have one single customer. Prices vary but can be very simple even using a single fee pricing structure. Needing sales invoices paid quicker - sales finance releases money (often up to 90%) against sale invoices before they are paid. This can be in respect of all invoices, on an ongoing basis, or you can select the invoices that you want funded without being tied in. You can use the money released for any purpose including paying wages, PAYE and NI. We can help you by finding funding for you. Needing help running your payroll - you can outsource the complete management of your payroll. Not wanting to do the back office administration - we can also help you outsource all of your back office functions, if you wish, from setup of a new recruitment business through to accounting and administrative paperwork of an existing company. You could be in a position to focus purely on finding and placing candidates, with someone else handling all of the other administrative functions on your behalf, if you wish. Needing help with credit control - you can outsource your credit control function, or use factoring which combines funding with credit control. Raising finance against RPOs - sometimes there are restrictions on the level of funding available against certain RPO organisations. 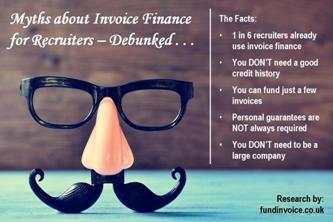 We have funders that will finance RPO invoices, alleviating these restrictions. Needing finance against up to 100% permanent placements - whilst funding temp placements is common place, financiers that will handle permanent placements are less common, due to the rebates that can be involved. However we have partners that will finance up to 100% perms. Wanting an alternative to Pay and Bill recruitment outsourcing services to reduce costs and the amount of control of your business that you give up to an outsourcer. You can outsource just about all aspects of your business if you wish, so that you are free just focus on making sales i.e. staff placements, and someone else does all the back office processing for you. The labour recruitment and provision of personnel SIC code group is very much suited to the use of receivables financing. Signed timesheets in respect of temporary staff placements, make those debts very clearly provable, which is very attractive to invoice finance companies. Hence they like to fund against those types of invoices. Even if you have previous adverse credit history, including CCJs (County Court Judgements), or being in a CVA (creditors voluntary arrangement). Even if you are not a homeowner. Even if you are a new startup company with no trading history. Criteria do vary between providers but we can introduce you to sympathetic funders. The pricing will vary between providers and facilities. You can read an explanation of the costs. Financing DePoel Invoices - more about finance against the major RPOs. Payroll Solutions Case Studies - using payroll support to run your payroll for you. Recourse Factoring For A New Start Recruiter - finance for new companies that might not be eligible for bank overdraft.